On February 1st, LKHZ will be visiting Mosser Elementary School in Allentown, PA to deliver to 4 new classrooms for the Monthly Classroom Project. This includes two learning support classrooms, a first grade classroom, and a kindergarten classroom. Thanks to recent generous donations, we were able to purchase $200 of supplies, and have more donations from sponsors to be joined with the kits! Items include a rug for a sensory nook, basic school supplies, and lots of toys and learning items to have fun while learning. Stay tuned for photos from the visit! If you’re in the area, come out and see LKHZ at the Bryn Mawr College staff association craft fair from 10-2 on December 3rd in Thomas Great Hall. As always, all money made will be donated to LKHZ causes, specifically sponsored students needs and a scholarship fund for next year. This is a really exciting opportunity to raise money for causes and get the word out about the organization and mission amongst staff and alumnae from Bryn Mawr College. This networking will hopefully make fruitful connections for future partnerships. For sale will be Key Of Knowledge necklaces, tab bracelets, shell rings, crayons, and other jewelry. Little Known Help Zone donated $175.00 to Brenda Johana, paying for her graduation. Brenda’s family was struggling to afford these fees, and without the payment, Brenda cannot graduate. LKHZ’s biggest goal is to see student reach success, so this was the perfect gift. The fees cover renting and decorating a venue, a celebratory lunch, and the graduation paperwork. This is a big day worth celebration. Brenda will graduate after the 2016 school year, making her family and Little Known Help Zone proud. A long time goal of Little Known Help Zone was to send children to school, now this is a reality. After raising $801 at the KTI Summit, it seemed only fitting to put that money to good use and send children abroad to school. Education is vital in the United States, and we are lucky to so openly receive it. Abroad, this is a rarity. Mayan children in Guatemala barely make it past 6th grade, girls being the more disadvantaged of the bunch. If a girl makes it past elementary school, she is an outlier. That is why it is so important we send all kids to school. I chose 2 children to be sponsored for the 2015 year, $360 will cover them for a year. Both of these students are girls in high school. Here are their bios and photos. By next week, the sponsorship money will be donated, and all of the high school students will be at school through Mayan Families! Claudia Marina is in 11th grade in 2015. She lives with her parents and four siblings in a two-room home. Her father works as a gardener and her mother works selling tortillas, but they do not earn much money, since neither attended school beyond the 6th grade. Brenda Yohana, was born on December 27, 1996. She is now in 11th grade in 2015 and her favorite class is art. In her free time she enjoys playing soccer. 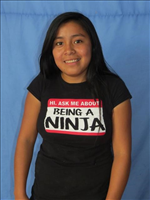 Although her parents were unable to attend school beyond the 3rd grade, Brenda hopes to continue to get a higher education, and is already an example for her younger and older siblings, being the first of the family to make to 11th grade! Stay tuned for when the donation goes through. 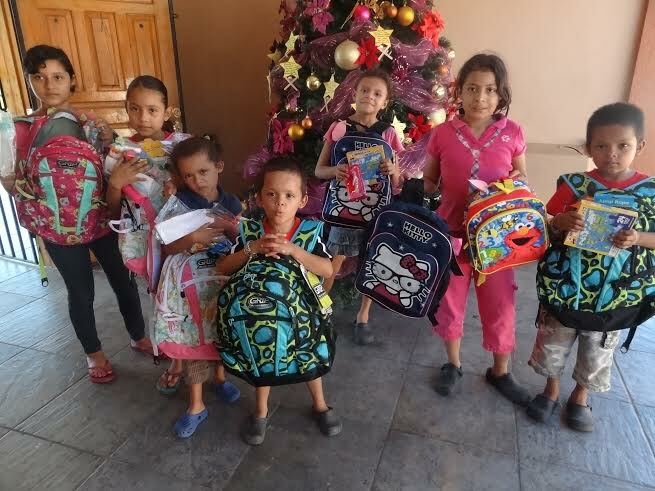 So happy to announce the children at Hogar de Amor received their backpacks. I was sent this adorable picture, and it is so heart warming to see them arrive and brighten the children’s day. Now they are set for school which starts next month! Thank you again to DIP Shipping for making this possible. Check out Helping Honduras Kids, a great organization doing amazing things in Honduras.